Fab India Neem Tulsi Soap infused with the goodness of neem and tulsi known for their anti-bacterial and anti-septic properties help clean the skin. 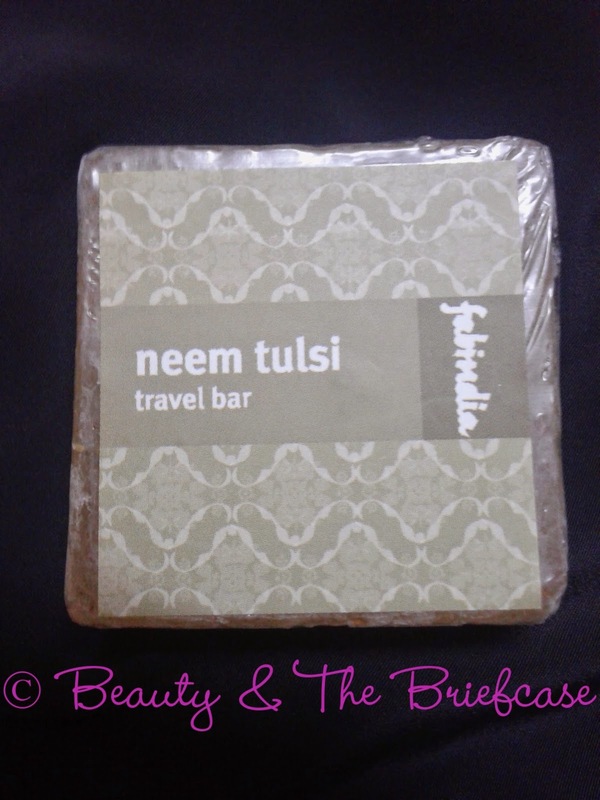 Fab India Neem Tulsi Soap is made with a perfect blend of essential oil and natural extracts which cleans the skin deeply and also helps to moisturize the skin. Soap Base (Sodium Cocoate, Sodium Stearate, Water, Propylene Glycol, Sugar, Sodium Lauryl Ether Sulphate, Sodium Chloride, Disodium EDTA and BHT), Glycerine, Castor Oil, Aloe Vera, Neem Leaves, Neem Extract, Basil Oil. Fab India soaps are available in two size variants of 50 & 100 grams, I really like that. The 50 g variant is a travel bar and i find that very convenient for me. When i'm travelling I hate using the soaps which the hotels provide, at these times a travel bar can be your savior. Now, lets talk all about the soap. The Fab India soaps come in a very simple packaging. Honestly i don't see how the packaging matters, when u are going to rip it of and thrash it. 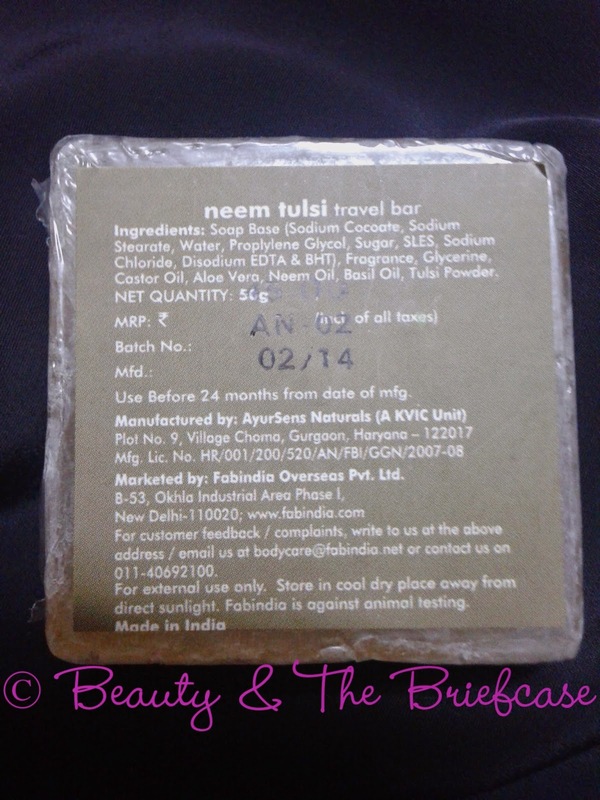 The Neem Tulsi Soap is yellowish brown in colour. It has a pretty strong fragrance and it lingers on for a while. Those who don't like strong fragrances, you should just skip this all together. The soap lathers a lot and cleanses the body really well. 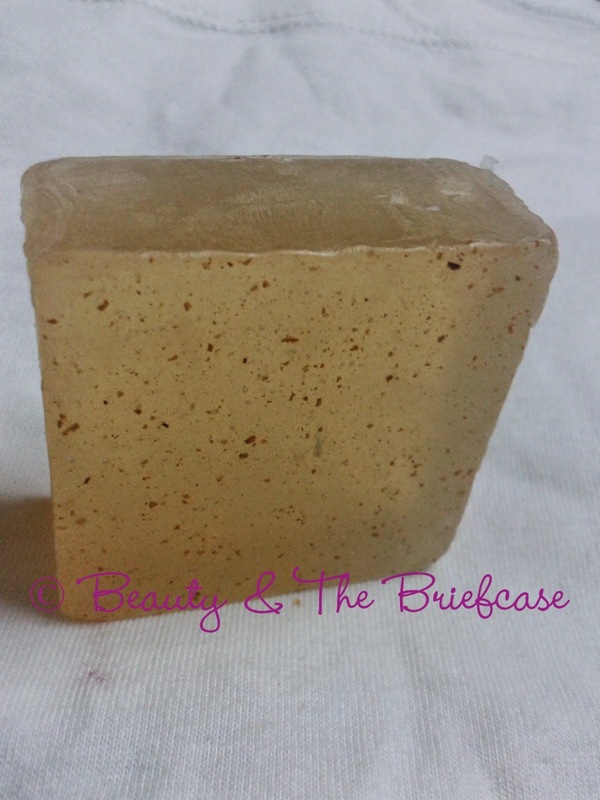 It has a thin layer of tiny scrubby elements and I loved it... They were not at all harsh. I hope Fab India converts this into a Scrub soap, i'm sure it would be amazing! Fab India are u listening to me... The soap lasted me for about two weeks and i'm satisfied wit h it. I really liked using this soap. 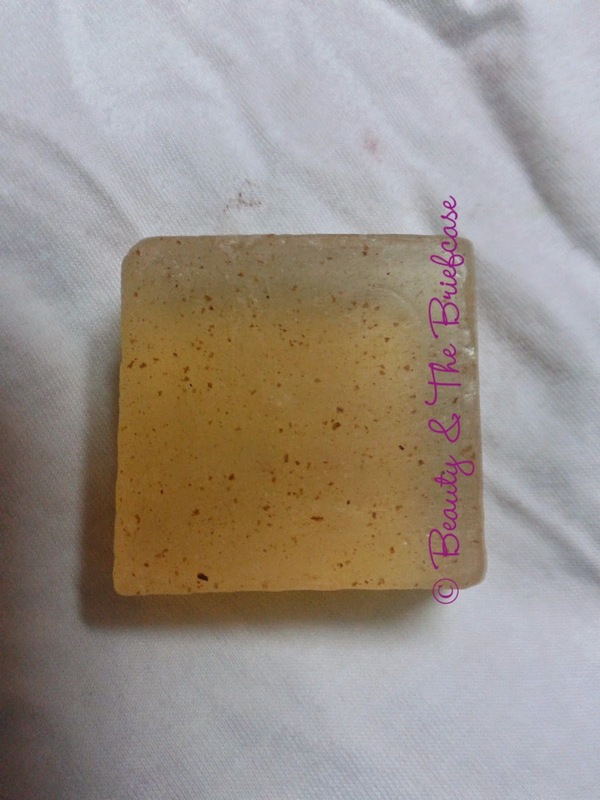 My skin felt good while using this soap and i simply loved the fragrance. If you like trying out new soaps then do try the Fab India Soaps. They aren't too pricey plus you get the benefit of trying out the travel bar and saving yourself a few bucks. Have you tried Fab India soaps before? Hope you liked this review? Do let me know your views in comments below. It's pretty sad yaar.... Working during Diwali! I'm pretty satisfied with the stuff i picked up... Going to check out their other products soon! any recommendations?? Nice review Karishma. I am crazy about natural soaps and have a dozen different brands of natural soaps at home currently :) This looks like a nice soap but sad to see that it has SLS. yet to try fabindia soaps !